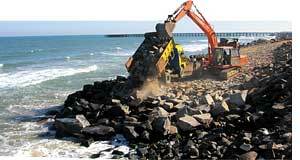 on july 31, an expert committee of the union ministry of environment and forest decided not to recommend the construction of rock structures designed to reclaim Puducherry's beaches from the sea. The committee has deferred its consent till there are proper studies on these structures--called groynes in engineering parlance. Puducherry's public works department has proposed the construction of groynes, but a group of activists from the union territory had petitioned the environment ministry against the proposal. Construction of hydraulic structures was an unscientific way of tackling coastal erosion, they contended. 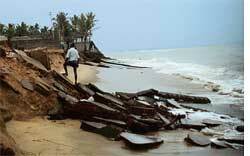 Coastal erosion is a serious problem in Puducherry. But the beaches did not disappear overnight. The problem began in 1989, when a harbour was built at the southern tip of the union territory.Two breakwaters were constructed as a part of the harbour which stopped the littoral drift, the natural south to north movement of sand. The country's eastern cost has a high littoral drift with an estimated 6 million cubic metres of sand moving south to north along the coast. The breakwaters in southern Puducherry meant that sand from the beaches of the state moved north but there was no sand to replenish it. So the area north of the breakwater lost all beaches. Consulting Engineer Services, a New Delhi organization which designed the harbour, had anticipated this problem. It had incorporated a sand bypass system in the harbour's design to obviate sea erosion silt from the harbour would be dredged and artificially pumped to the other side, restoring the movement of sediments along the coast. Says M D Kudale, chief research officer of Central Water and Power Research Station (cwprs), " a sand bypass system was put in place but seldom used except for a brief period between 2000 and 2001, when small stretches of beach began to reappear. But the system was discarded in 2002, and the beaches disappeared once again." By 2002, Northern Puducherry had lost all sand. Structures along the coast began to crumble as sea water intruded into their foundation. In 2002-2003, the state government decided to build a seven km long seawall consisting of boulders along the coast. Rs 40 crore were spent on the construction. While Puducherry was saved temporarily, the problem of erosion was transferred to villages in Tamil Nadu in the north. By 2006-end, areas in the state north of Puducherry had lost 200 metres of beach and the sea waves destroyed a few houses and killed a child. The Tamil Nadu government had to fortify these villages with a seawall. Meanwhile, in 2002, experts from the Indian Institute of Technology Chennai and the National Institute of Ocean Technology (niot) suggested that groynes be erected on a trial basis in Puducherry. Civil society groups like Indian National Trust for Art and Cultural Heritage and Citizens Forum For Puducherry opposed the move, contending that groynes would only transfer the problem of erosion towards the north of the structures--much like the breakwaters. The issue was raised in the union territory's legislative assembly in 2002. The government had then assured that it would seek a second opinion on the subject. It decided to seek the opinion of the Danish Hydraulics Institute (dhi), a Delhi-based consultancy . In June 2004, Z S Tarapore, a consulting engineer with dhi and a former director of cwprs warned the Puducherry government against building groynes.Tarapore, who had studied the site in 2002 at the behest of Puducherry's public work's department, wrote "There were proposals to protect the coast... by two trial greyness, to protect this critical reach. I had pointed out that this was a dangerous proposition since the greyness would only transfer the problem further down-drift, where there are heavily populated areas." Tarapore also wrote that the government must conduct a "morphological" study before manipulating the shoreline. He was not the first to warn. In 1978, before work on the harbour had begun, cwprs had carried out a study which suggested a sand bypass system once the harbour was built. 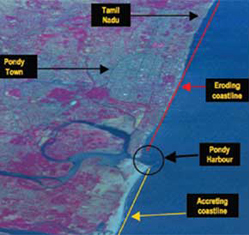 On November 3, 2007, a consultation entitled "Restoration and Protection of Pondicherry-Tamil Nadu coastline, was held in Auroville near Puducherry, where senior government officials from Tamil Nadu and Puducherry as well as hydrologists from it Chennai, niot, cwprs discussed strategies to save the coastline. "It was unanimously agreed that soft solutions such as beach nourishment using a sand bypass system should be used to control erosion," says Probir Banerjee, a civil engineer and coordinator of Pondicherry Citizens Action Network (pondycan). Kudale of cwprs also believes that groynes are a hard solution and must be built if there are no alternatives. He believes that bypass systems have worked very successfully at Visakhapatnam's port where there is a similar problem. At the November 2007 consultation, the Puducherry government officials assured that the sand bypass system would be reactivated. But a few days after the meet, rocks began to be dumped at the Kuruchikuppam area towards the north of Puducherry town--for erecting groynes. This was done without applying for coastal regulation zone (crz) clearance. In January 2008, pondycan along with another ngo, Coastal Action Network, filed a public interest litigation in the Chennai high court, seeking a stop on the construction work. A month later, the court directed that the public works department should get environmental clearances for the project. The department applied for crz clearance in February 2008. According to a Union environment ministry official, the Centre had asked the Puducherry government to stop work on the groynes because it had not applied for crz clearance. "A notice was sent to the state public works department asking it to stop all work on the groynes, he said." Meanwhile in January this year, the Tamil Nadu government initiated an enquiry on erosion in Kottakuppam block in Villupuram district. The report of the enquiry noted. "All villages in Kottakuppam block and other areas of Vannur Taluk of Villupuram north of Puducherry, are at the risk of sea erosion because sea walls/groynes had blocked the natural transport of sand up and down the coast." It further added that if construction proceeds further in Puducherry, it would "aggravate the erosion on Tamil Nadu coast especially in the Villupuram district". pondycan also petitioned the environment ministry against the Puducherry government's groyen building spree. In January, Meena Gupta, then secretary at the ministry, wrote a letter to Puducherry's chief secretary, Rashid Behary, asking him to initiate a dialogue with his counterpart in Tamil Nadu. "It has been brought to our notice that the recent construction of groynes has only shifted the problem north of Puducherry... I would appreciate it if you could ask the concerned authorities in Puducherry to discuss the matter with their counterparts in Tamil Nadu, so that our beaches can be saved," Gupta wrote. On May 22, 2008 the issue of crz clearance came up before the ministry's additional expert committee of new construction. The ministry sought details of littoral drift, erosion and alternative measures for shore protection. Gupta had also instructed that the expert committee must consult the groups opposing the groynes before recommending clearance. "The secretary had clearly noted that pondycan be consulted when members of the expert committee visit the site. But that wasn't done" says Aurofilio Schiavina, a hydrologist based in Puducherry. In fact, according to an environment ministry official, the committee had almost decided to give go-ahead to the groynes in its July 31 meeting. One of the members then pointed out that objections against the structures had not been weighed and they had to be studied before considering the application for clearance.